While the rear loungers are going to get the most attention, it was the sporty wakeboard tower with large dual speakers that caught our eye as well as the powerful Mercury on the back. A cozy U-shaped seating area is created when you go with the optional bow filler cushion. There are two lounges in the bow with a fold-down arm on the starboard side and just enough room on either one for most people to stretch out. What’s better than having a comfortable captain’s chair that slides, swivels and reclines? How about a second one for the first mate! Having dual helm chairs is one of our favorite floorplans based on the look as well as the added comfort. At the raised helm platform is a fiberglass console with a vinyl clad cap and a stitched brow with a good selection of multi-function gauges below. There is also easy access for the captain to work the toggle switches on the right, and a key option on this particular boat is the Lowrance Hook 5 depth finder that includes GPS mounted above the throttle. 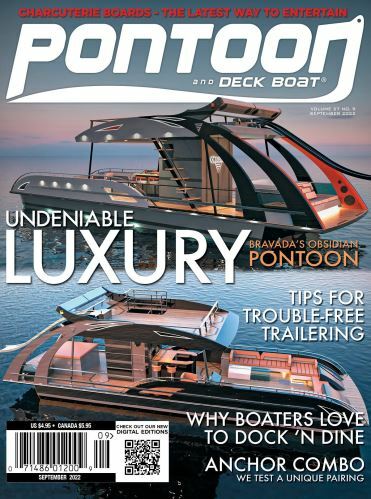 You would guess this pontoon had a lot more speakers than just six, but that’s all you need when you have a Polk Audio sound system. With the dual 6- by 9-inch tower speakers, dual amps tucked away below the helm console and a subwoofer, this setup was easily one of our favorites. Making your way towards the stern, the two rear-facing lounges are extremely comfortable with storage room below. We especially like the railing in the aft that will help keep everyone safely inside. Other key features include the ski pylon on top of the solid wakeboard tower, a matching black boarding ladder that ties into the exterior rails and a center ski locker with an automatic bilge pump. If we had to be picky, the seating is a little limited with this floorplan. Rated for up to 11 passengers, it could get a little cozy with that many onboard – even with the optional bow filler cushion. There is a lot packed into this 23-footer and realistically comfortable seating for around eight or nine. Below deck there are three 25-inch diameter pontoons with lifting strakes on both sides of the center tube and on the insides of the outer ones. The TLX chassis is on 16-inch centers and the full aluminum splash skin completes the hull design. Up top there is over 17 feet of usable deck space from inside the gates and the rail height varies from 24 inches tall in the stern to 29 inches tall in the bow. There are three gates onboard including the wheelchair accessible portside entry that is over 32 inches wide. With the Mercury 250 Pro XS on the back we shot off like a rocket, going from zero-to-20 mph in just four seconds. She turns well, especially in the sharp corners, and at wide open throttle we nearly reached the 50 mph mark. There is a lot to appreciate on this Lowe Retreat and it starts with the sporty wakeboard tower that sets the tone for the rest of the boat with its matching black exterior rails. When you factor in the Polk Audio sound system and the Mercury 250 four-stroke you have a recipe for a great time on the water and a solid platform to begin making memories. Why we love this boat…When Polk Audio is involved, you know you’re dealing with a high-quality sound system. It’s not a party at the sandbar until this pontoon shows up. Just being picky…There is a lot packed into this 23-foot floorplan but the seating feels a little limited, especially considering the maximum seating capacity is 11. Heavy-duty 9-foot Bimini top, custom reclining helm/passenger seats, plush port/starboard bow lounges, two rear-facing lounge seats w/armrests, raised fiberglass console, and Bluetooth-compatible Marine Audio stereo. Black fence/gray furniture, flat-back tandem axle trailer, Polk 5 channel stereo system w/subwoofer/amp/four speakers, removable bow bench seat, Lowrance Hook 5 w/GPS depth finder, TLX chassis w/16-inch centers/center log storage, wake tower w/black top, black frame/lighting pkg., and Polk wake tower 6-by 9-inch lighted speakers.